A Land Acknowledgement is a formal statement that recognizes and respects Native peoples as traditional guardians of lands and the enduring relationship that exists between Native peoples and their traditional territories. 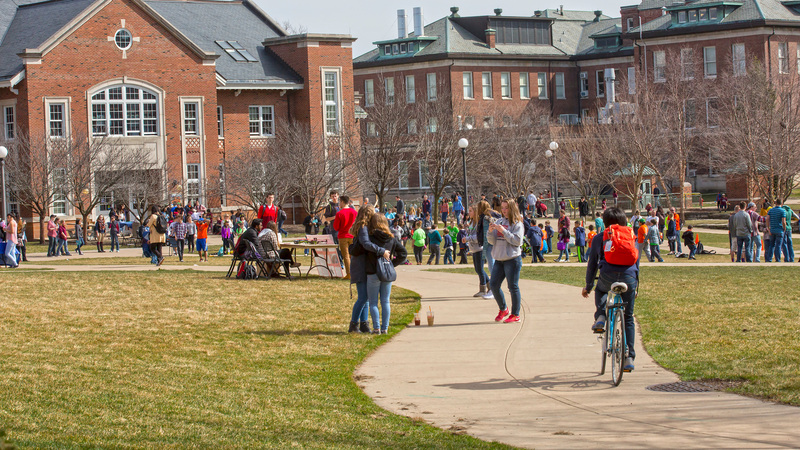 The University of Illinois at Urbana-Champaign recognizes the land acknowledgement statement is an expression of gratitude and appreciation to those on whose territory we reside, and a way of honoring the Native peoples who have been living and working on the land from time immemorial. The Acknowledgement is shared at events such as graduation, convocation, and critical conversations. However, University faculty, staff and student organizations are welcome to use the suggested language at their events. The objective of these guidelines is to establish recommendations for University of Illinois employees and student organizations about appropriate and consistent recognition and acknowledgement of Native peoples as the traditional guardians of the lands on which the University of Illinois at Urbana-Champaign is situated. Considerations: Regardless of the length of the Acknowledgement, the Acknowledgement is read aloud as the first order of business or at the opening of an event by the first speaker or host. As a land-grant institution, the University of Illinois at Urbana-Champaign has a responsibility to acknowledge the historical context in which it exists. In order to remind ourselves and our community, we will begin this event with the following statement. We are currently on the lands of the Peoria, Kaskaskia, Peankashaw, Wea, Miami, Mascoutin, Odawa, Sauk, Mesquaki, Kickapoo, Potawatomi, Ojibwe, and Chickasaw Nations. It is necessary for us to acknowledge these Native Nations and for us to work with them as we move forward as an institution. Over the next 150 years, we will be a vibrant community inclusive of all our differences, with Native peoples at the core of our efforts. I/We would like to begin today by recognizing and acknowledging that we are on the lands of the Peoria, Kaskaskia, Piankashaw, Wea, Miami, Mascoutin, Odawa, Sauk, Mesquaki, Kickapoo, Potawatomi, Ojibwe, and Chickasaw Nations. These lands were the traditional territory of these Native Nations prior to their forced removal; these lands continue to carry the stories of these Nations and their struggles for survival and identity. As a land-grant institution, the University of Illinois has a particular responsibility to acknowledge the peoples of these lands, as well as the histories of dispossession that have allowed for the growth of this institution for the past 150 years. We are also obligated to reflect on and actively address these histories and the role that this university has played in shaping them. This acknowledgement and the centering of Native peoples is a start as we move forward for the next 150 years.